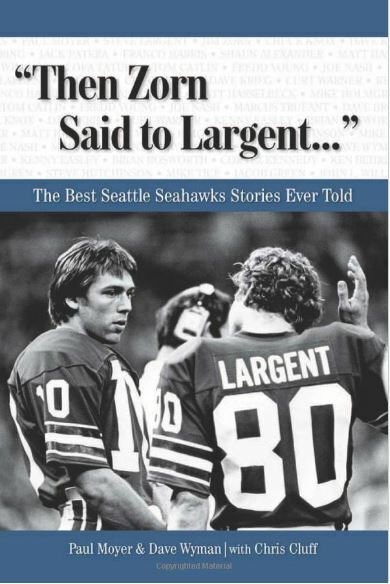 The Seahawks have rediscovered the formula that won them a Super Bowl: No. 1 defense plus Beast Mode plus DangeRuss plus crappy offensive line. Can you imagine what kind of season Marshawn Lynch would have if he was running behind the 2005 Super Bowl line that featured future Hall of Famer Walter Jones and All-Pro Steve Hutchinson? We’re probably talking a 2,500-yard season with 30 touchdowns. But that’s fantasy. Reality is that this line is basically in the same shape as the one that limped into the playoffs last season. The line might have endured its worst game of the season Sunday against the San Francisco 49ers — not a good sign as it prepares to face an Arizona defense that gave it plenty of trouble four weeks ago. Against the 49ers, the line gave up 10 hits on quarterback Russell Wilson, including five sacks, and committed five penalties. On top of that, left tackle Russell Okung suffered a bruised lung and is expected to miss the big battle for control of the NFC West on Sunday night in Arizona. The performance vs. the 49ers was much worse than two weeks ago, when the same line — the four outside starters and backup center Lemuel Jeanpierre — gave up five QB hits (four of them sacks) and committed three penalties. Granted, the 49ers have the third-best defense in the NFL (behind the Seahawks and Detroit), and the Hawks were playing without center Max Unger for the fourth straight game. But they have to be concerned as they prepare for an Arizona defense that sacked Wilson seven times and hit him 11 in Seattle’s 19-3 win in Week 12. Wilson has now been sacked 38 times — going down on 8.7 percent of pass plays, which is fifth highest in the NFL. Last year, he was sacked 44 times. Rookie right tackle Justin Britt seems to have regressed in recent weeks — former Seahawks center Robbie Tobeck thinks it could be just a typical rookie problem. Britt certainly was overmatched against the 49ers. On the first drive, he was beaten by Ray McDonald, who hit Wilson as he launched a throw downfield. Britt was beaten on the second drive by Ahmad Brooks, who hit Wilson as he threw it away. On the third drive, Britt was called for holding after he tackled Brooks to keep him from Wilson; that negated a 22-yard pass to Paul Richardson. 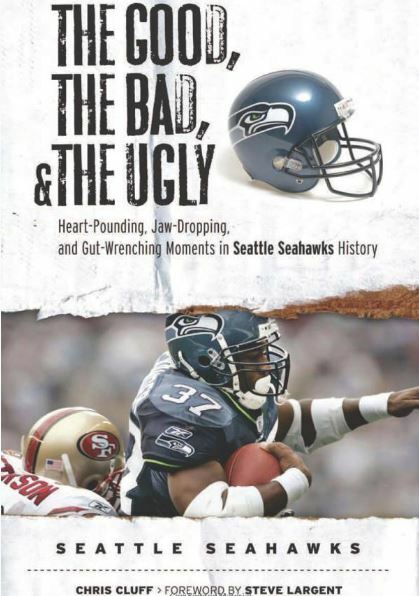 After Okung was called for his sixth false start of the year (second most in the NFL), the Hawks faced a second-and-18, and Britt was beaten to the inside by McDonald, who flushed Wilson out of the pocket and into just a 1-yard gain. Seattle ended up punting. Right guard J.R. Sweezy was just as bad as Britt at times. On the fourth drive, toward the end of the first half, Sweezy had back-to-back poor plays when he gave up a sack to McDonald and then committed a false start (obviously trying to get a jump on stopping another jail break). Sweezy had a hand in Wilson’s interception to end the half, too: He missed picking up McDonald on a stunt and Wilson was pressured into making a poor decision. Unlike the Arizona game, when Wilson was responsible for at least three of the seven sacks, he was simply running for his life vs. the 49ers on Sunday. The Hawks even gave up a sack on a screen play (just as they did against Arizona). As Tobeck said, that should never happen. In the first half, they ran it 11 times and called 21 pass plays. 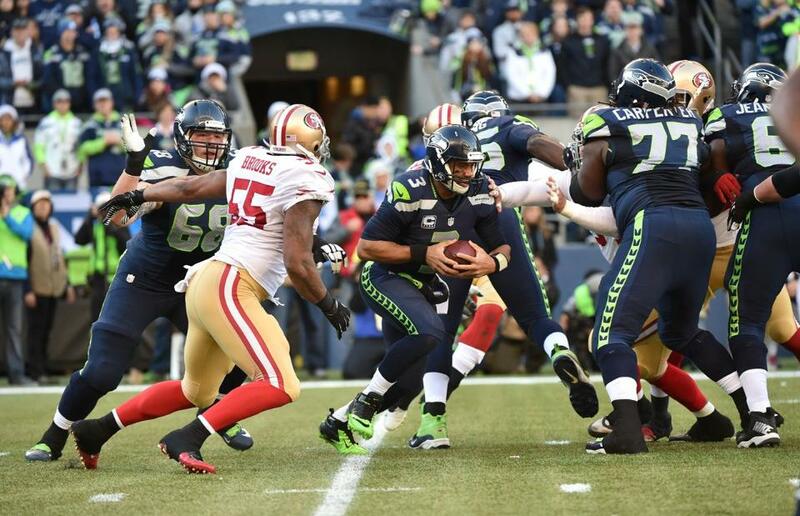 In the second half, they ran it 21 times and dropped Wilson back eight times — he still was sacked on two of those. The problems figure to continue as the Hawks face the Cardinals and then the always punishing St. Louis Rams defense as they seek to secure the No. 1 seed in the NFC. They probably will have to do it without their full starting line — Okung could miss both games and Unger might not return until the Rams game. But it’s not like they haven’t been here before. 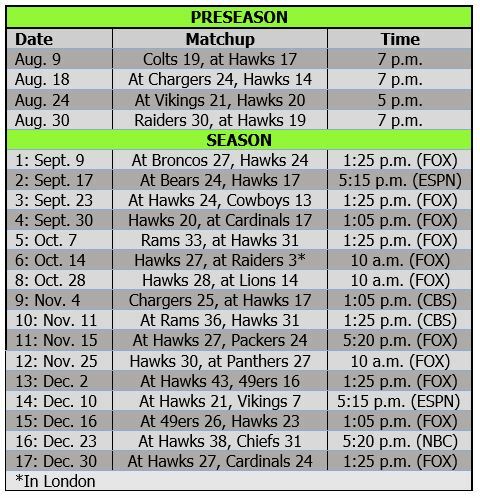 Without Okung this week, the Hawks will start their seventh line combination of the season — matching the number of combos they had in 2013. Last year, they had a different starting lineup in each of the final three games, and they surrendered four sacks in each game. They went 2-1 in those games, losing at home to Arizona, but still managed to secure the No. 1 seed. This time, a 2-1 finish will not be good enough to net the top seed, and they know it. To win both, Wilson is going to have to help make up for the line deficiencies and play as well as or better than he did in the earlier game. It will help if Carroll and his coaches remember that the Hawks are a running team. With Wilson helping Marshawn Lynch, the Hawks lead the league at 169 yards per game — up 32 from last year, when they ranked fourth. They also should have learned from the win over the 49ers that their passing game works well when Wilson gets rid of the ball quickly — not allowing the pass rush any chance to affect him. In the end, just like last year, the fact that the Seahawks have the top-ranked defense, Wilson and Lynch should help them overcome their unstable offensive line.